Опубликовано 11.01.2019 пользователем July N.
In the video, a strange band of black objects can be seen hovering in formation among the clouds. These figures – which group to make a triangle formation – seemingly do not move for the duration of the video. “The triangle is still there,” remarks a shocked witness as he films the unexplained objects.Baffled by the clip, witnesses sent their footage to YouTube conspiracy theorist MrMBB333 in an attempt to understand what the strange triangle might be. “When you first look at this, you’re going to think: ‘Okay, that’s a flock of geese or ducks flying in a V pattern’ – but no, those are stationary, and they did not move,” he said. 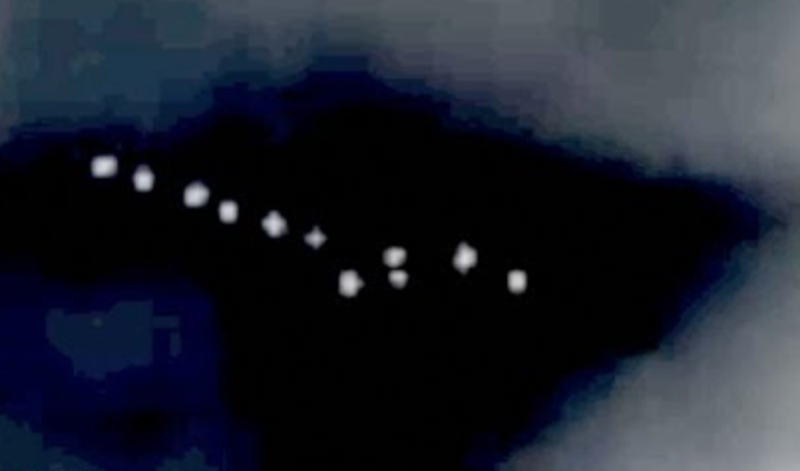 As he begins to adjust the exposure of the clip, a large object starts to become visible behind the formation. MrMBB333 goes on to refer to the giant figure as “the outline of some sort of craft”, claiming the objects visible in the sky may be “inside or on top of whatever is in the background”.The bizarre clip has gained more than 65,000 views since its upload yesterday (January 3). And viewers are convinced the objects are part of an alien ship. “I think it's a massive cloaked ship entering Earth's atmosphere,” claimed one viewer. Огромное формирование НЛО наблюдали в небе. Некоторые думают, что это был замаскированный инопланетный корабль, следящий за нами. На видео мы видим странную группу черных объектов, плавающих в облаках. По словам очевидцев, этот НЛО был замечен в пасмурную погоду в Портленде, штат Орегон, США. Это видео появилось в сети 3 января 2019 года, дата съемки не указана.